Clean all equipment thoroughly to remove any traces of fat. Place egg whites and cream of tartar in the bowl of a stand mixer fitted with a whisk attachment. Whisk on medium until frothy. Then, add in a tablespoon of sugar and mix on high until stiff peaks have formed. Add in the sugar one heaping tablespoon at a time. Mix to stiff peaks between each addition. Once all of the sugar is in and the mixture is stiff, add in the vanilla, peppermint, and matcha. Mix for another 5 minutes. The mixture should be glossy, and the sugar should be mostly dissolved. Pipe on to a parchement lined baking sheet in tablespoon sized dollops. Bake for 30-40 minutes. After 30 minutes, quickly check to see if the meringues will lift cleanly off of the parchment. If they do, keep them in the oven, and turn off oven. If they do not lift cleanly, cook another 10 minutes, and then turn off the oven. Leave the door closed until they have cooled completely. 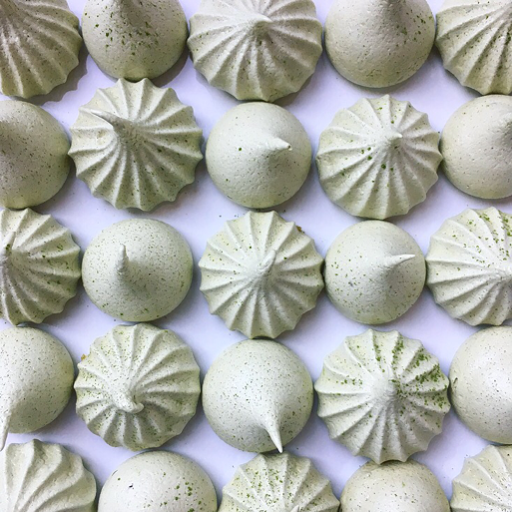 Once completely cooled, remove from the oven and dust lightly with matcha powder.